Is there anything more enticing for an actor/producer than the release of his flick run the show in newschannels, tabloids as well as mainstream newspapers, the netspace head over heels about it, even the state legislature discussing publicly about the movie to an extent that the Chief Minister comes down to see the film! A frenetic aura surrounding a movie release as if it was an Olympic Opening Ceremony happening in town. 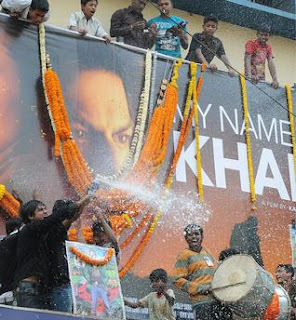 Still, you have butterflies in your stomach on the release Friday, even if you're the SRK... Bollywood's King Khan. Honest confession: I'm no SRK fanboy. I admired his work when he was the old simple Shah Rukh Khan who gave us Circus, Kabhi haan Kabhi naa or Baazigar but lost his fine skills somewhere on way to becoming the SRK. But the point of talk here is entirely different. This spring-storm blowing through the nation in the name of the Khan is not just about this one person, or one city standing upto partisan politics, hate play and hooliganism. There is a larger vistarama frame to the whole turmoil. The My Name Is Khan aftermath has sent out the right message to 'leaders' of the wrong breeds: Everything you do wont be tolerated everytime. Shiv Sena and its moth-eaten kingpin, who always had a spell over Mumbaikars has been peed on twice in less than a fortnight. Rahul Gandhi made a dumbass out of the Thackerays last week, and now SRK and an enterprising Mumbai have pissed right on his face. Somebody on Twitter designed a new logo for the old Sena tiger...the once very fearsome Tiger. How very symbolic! Is this an indication of a maturing society, identifying and isolating the sectarian forces and standing upto them? Isn't this a proof that denominational dogma doesn't rule the senses of majority and the educated new generation is ready to dump them? Does this not prove beyond any shadow of doubt that if our rulers are determined to maintain decorum, then it stays put more often than not. Kudos to Maharashtra Govt who made a statement by using the arm of the law to crush down the ruffians. Not to mention the sublime power of unity among the countrymen to utilize all possible channels; Facebook, Twitter, blogs, you say it, to crack down on the mob-ocracy. You see, it doesn't matter if MNIK fails to break Box-Office records, no matter if SRK's characteristic over-acting, this time as an Asperger's Syndrome individual (doh!) 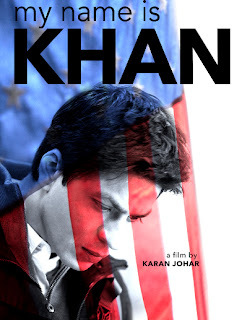 again fails to impress, no matter if Karan Johar has once again managed to churn out a mediocre dampener, MNIK will go into pages of history as an event which unified the nation against the 'elements'. The elements which we have to be wary of, who're as lethal as the 'internationally branded' ones from across the LoC. The same elements which feast on the fear-factor of public, plaguing on our misinformation, illiteracy and poverty to good use to cash-in on their treacherous, hideous and misplaced agenda. The elements which work to fragment our nation in the name of caste, language, culture and sundries. The SRK-Sena showdown was seen by many as a guerrilla marketing strategy, but I care less. Afterall who is the loser? Only those who had to be defeated. That's the whole point. Dignified press persona Barkha Dutt, Pranab Roy (NDTV), Rajdeep Sardesai (IBN), Aaj Tak, Star News et al endorsed MNIK as if the movie was their collaborative in-house production released by the Press Council of India. Shah Rukh, you've managed to accomplish something unprecedented. You turned the whole mass-media contingent into an advertisement board, the usually sedentary and cold-footed Maharashtra Govt wake up to perform their duty, brought out entire net-gen to campaign ferociously for him (even people who can't stand him), even managed to arouse the watchful and tongue-tied Bollywood co-stars join hands and raise voice for him, instilled confidence in the multiplex-mall owners to be brave enough and reminded for once and all the citizens of the Mumbai megalopolis that the city belongs to them and not to some impious partisan advocates. Bottomline? Thackrey and his ShivSena bite the dust...Period. Remember the last time such a widespread public anger and unity was seen? After Mumbai 26/11. Then, it was the 'foreign' terrorists that lost out to Mumbai, this time the home-grown outfits... How ironic! It seems things have come the whole circle for Senas of all breeds. I mean, for this guy Muthalik and his Sree Rama Sena, the Kannada incarnation of Shiv Sena; only difference that its been a fart without sound. The same cowardly beast who laid hands on hapless women last year. Well, he got something well and truly deserved. lol..
By God, Muthalik is talking about Democracy, and condemning act of 'Goondaism'! GOD! *goosebumps* *goosebumps*... For him Democracy = men assaulting women in public; Goondaism = inkstaining... Next what, Osama Bin Laden preaching peace and harmony? The message from the public appears clear: A Thackarey or an itch like Muthalik is NOT going to dictate terms to us. India is a democracy and we have full rights to act within the boundaries set by our Constitution, who the heck are you to draw the lines? You have no place in modern society, neither have you any role in building the India of tomorrow.